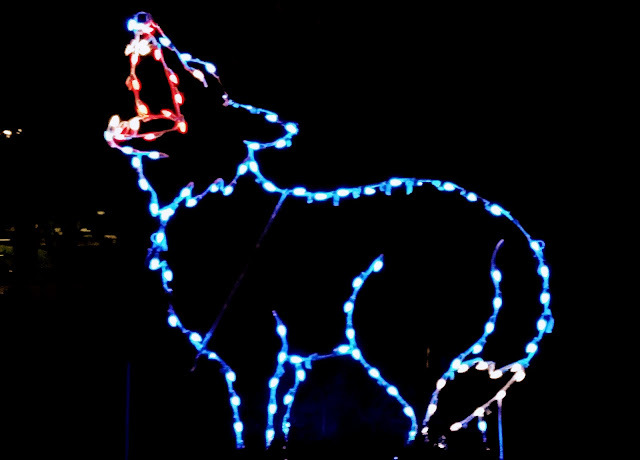 MidAtlantic DayTrips: Animals, Animals Everywhere at ZooLights! 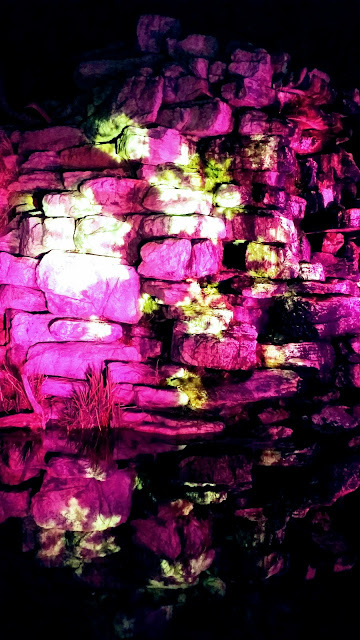 There are few holiday light displays with elephants, cuddlefish, naked molerats, and orangutans, but ZooLights at the Smithsonian National Zoo in Washington DC is one of them! And unlike many (most?) other holiday lights displays, this one is completely free. I love holiday lights displays -- that's how I get into the holiday spirit, and having the chance to stroll leisurely through the lights, enjoying the bedazzling spectacle, with a cup of hot chocolate in my hand (or wine -- you can purchase wine there as well, hint...) is really a treat! The National Zoological Park, commonly known as the National Zoo, is one of the oldest zoos in the United States. It is part of the Smithsonian Institution. The best-known residents are the giant pandas, but the zoo is also home to birds, great apes, big cats, Asian elephants, insects, amphibians, reptiles, aquatic animals, small mammals and many more. Expanding knowledge about the needs of zoo animals and commitment to their well being has changed the look of the National Zoo. Today, animals live in natural groupings rather than individually. Rare and endangered species, such as golden lion tamarins, Sumatran tigers, and sarus cranes, breed and raise their young – showing the success of the zoo's conservation and research programs. But it's worth noting that on this trip to the zoo, you're not really seeing the REAL animals, other than nocturnal critters in the Small Mammal House and Reptile Discover Center, where you can go to warm up after you start feeling too cold. You're there for the lights. Make your own s'mores: warm up as you roast marshmellows over a roaring fire and enjoy your handiwork! Take a merry tour on the Zoo Choo-Choo, a trackless train that whisks guests around the Great Cats exhibit and features gorgeous views of the holiday light displays. Take the plunge down one of the 150-foot-long snow-less tubing tracks. Hop on to your choice of 50 animal figures on the Speedwell Foundation Conservation Carousel. Next weekend: GRUMP Holiday Market Dec. 15 to 17, 5 p.m. to 9 p.m.: A European-style outdoor market featuring local artisans, will be located at the Zoo’s Connecticut Avenue entrance Dec. 15, 16 and 17. This alternative art and crafts holiday show features gifts for all ages, from handmade clothing, jewelry and books to home accessories, including prints, upcycled decorative pillows, glass art and more. Getting there: 3001 Connecticut Ave NW, Washington, DC 20008. Take Metro! Woodley Park - Zoo Metro Stop is a scant .4 mile away. You could park, but it's a popular event and parking could be dicey. Hours: Friday, November 24, 2017 to Monday, January 1, 2018, 5 p.m. to 9 p.m.